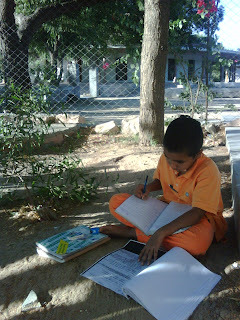 Our examinations are on again and the cooler winter weather makes the best place to study in the sun. Our school has 1/2 yearly exams in December and the yearly exams are in March and April. It's not the best photo however you can see that the new part of the school building is coming up quite fast. There is quite a lot of difference compared to the post of 22nd October. A few days ago the school children all came together in the garden to do Yoga. I don't know who this boy was saluting to but the photo is priceless. 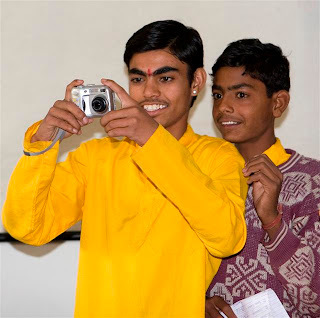 One of the exciting projects that has run in our school in the past is a collaboration with Twin Vision, a charitable group that teaches multimedia skills between cultures. We have enjoyed watching the students learn photography, video, mime acting and mosaic art from experts who come from England to share their knowledge. One of the highlights was the students learning how to make cameras (that really work!) out of an empty soft drink can (see the top left photo). The next project will run in January/February 2009 with a team coming to teach animation to the students. Some photos from past projects are here for you to enjoy. As you can see in the photo the foundations of the new school rooms are coming out of the ground.This is one side of the building work that is going on at a terrific speed. Thanks to everyone in Sydney and Perth who supported the building works with donations whilst i was there visiting. Hoping that everyone enjoys seeing this project come "out of the ground". Great news from Jadan is that construction started on the next phase of the school building. The building will have an extra 32 classrooms which means that the school will eventually be able to cater for over 1700 students!! As the school building will be completed the construction of a college building will start just next to it. That building will cater to 700 students who will study up until the Bachelors and Masters Degree level. It means that the students of our area will have the chance to complete a full, quality education in a secure environment. It is a chance which many, especially the girls, would never otherwise dream of having. Shree Paramhans Swami Madhavanand College is already running, with 35 students presently in first year of their Bachelor of Arts course. Their lectures are in some of the rooms of the school building at present and will continue to be there until the college building will be ready. It is cramped and sometimes confusing to fit them all in but nobody is complaining because their dreams are coming true. The students in year 12 science are our first batch that will sit the final examinations in the subject. In the Rajasthan Education system students who study Science must study Chemistry and Physics and then choose for their third subject either Mathematics or Biology. These photos are of our biology students. The girl in the middle of the second photo is a most brilliant student who has won several scholarships from the Government due to her results in the last two years. What amazes me about these students is their focus on their studies. For the whole of 11th and 12th class our science students have been studying day and night. We constantly have to go to the hostel in the evenings and explain to them that there is a long way to go and that they need to keep a balance and get some sleep as well. This is their chance to take a step in life, the students largely being first generation learners, and perhaps because of that they appreciate even more the chance that lies before them. Our computer lab is one of the busiest parts of the school/college with students continuously in the class from 830am until 530pm. The computer teacher is absolutely run off his feet but he is still loving it. Thanks to the people of Bremmer Tafe in Queensland and the Ipswich Multi Cultural Society who together are arranging for the supply of 10 computers for the school which will come in October, the first one having arrived last month. By next year we hope to open a second computer lab in the school so that students can have more lab time. If you are upgrading your computer or your laptop keep in mind that there may be a happy home for your old computer in our school!! Anyone who wishes to help with this please contact my email. Also thanks to the Yoga In Daily Life Ashram in Queensland who have upgraded their multimedia projector and made sure that our school got the old one. It is awesome and opens a new dimension of teaching which hasn't been seen in this area before. These photos of the school are taken from "the mountain". 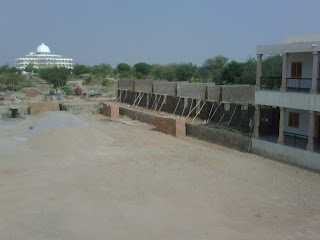 For those not familiar with the Ashram in Jadan one of the projects already undertaken was a rainwater harvesting project in which a dam 120m x 140m x 10 m deep was constructed in the Ashram for the purposes of catching rainwater. 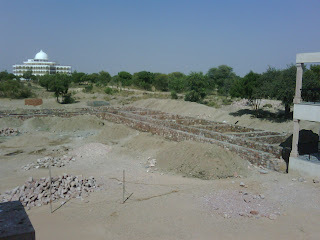 The earth and rock that was excavated from the dam was used to make a mountain of 45 metres height in the south west corner of the Ashram. Swamiji Maharaj's idea of making a mountain was practical as well as beautiful. It saved money on diesel which would have been used transporting the earth out of the Ashram, the mountain is a place of beauty and has become a tourist attraction in it's own right and according to the ancient science of Vastu Shastra the highest and heaviest point in a property should be in the South West corner. The future construction of the school and college which is now starting will make the present building into a quadrangular shape extending the two sides forward and then joining across the front of the school. After that is completed a seperate college building will be constructed to the left of the school as you look in the photos. In the distance of the top photo you can see Shree Paramhans Swami Madhavanand Hospital, built by Swamiji Maharaj and the "Austrian Hospital in India" Society from Vienna Austria. It is a beautiful building which will house a 90 bed allopathic hospital for the people of the local area. At present the building work is complete and the work of furnishing and equiping the hospital is underway so that the hospital can start in the next months. Full house for morning prayers and assembly. When the students are singing their morning prayers and national anthem in the morning the sound goes through the whole Ashram, reaching more than 2 km away. It is a really special part of the morning. Classes are on and concentration is high. Some first class students were also lucky enough to have Swamiji teach them for a short while. To everyone who helped, once again thanks. This is our fleet outside the school building. Hopefully for next year we can add one or two buses more to the photo. It has been an interesting month in school. A lot of new students settling in and learning to work together. This week the district sports tournaments are on and a lot of students are away competing. They are competing in the badminton, tennis, cricket, handball and judo tournaments. In Judo 9 of the girls and 4 of the boys won their divisions. The girls u/17 tennis team is in the finals today and the u/19s lost in the semis. The boys came third in the handball and in the senior cricket, the juniors are yet to play. On the 4th of September the ground breaking ceremony was done for extensions of the school and college building. There will be construction of 30 more rooms which will then cover the needs of the school way into the future. At present the situation in the building that we have, which seemed soooooo big just 8 months ago, is really really really tight. The real news of the last month is that broad band reached to our village! So now i hope that in the future we can get some more interesting photos and items onto this webpage for everybody to enjoy. Hari Om and welcome to the new school year!!! It has been a most intense fortnight here in Jadan. We have been taking admissions for school and college which both started on 01st July. 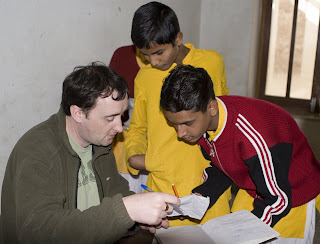 There has also been a huge increase in the number of students in our hostel for this session. The number of students has crossed 900. On top of that there have been more than 500 families come with hope and expectation to which we have had to say sorry, the school is full. Till date they are still coming. This year with Swamiji Maharaj’s blessing we also started College courses in Bachelor of Arts and the response was beyond expectation. 30 students have enrolled in the course. The students are from the villages and are mainly those that wouldn’t have gone to a regular college but would have studied by correspondence. There has been a special interest from parents who wouldn’t send their girls to a government college because of security issues. It is gratifying to see them happily send their children to the college in the Ashram. We ended up purchasing the third bus in early June. After much deliberation the decision was taken to get a new bus rather than second hand. Although it proved much more expensive the decisive issue was fuel consumption, which is nearly half in the new bus. Considering the environment and the cost of diesel it seemed a prudent option. Of course, as is the norm in Indian culture, there were many issues with getting the bus here on time etc and in the end the bus was delivered in the Ashram at 3am on the 1st of July. After a quick sleep the driver set off at 0630am to pick the students up for school!!!!!!!!!!!!! classes, 5 buses and 109 boys staying here in the ashram in our hostel. Full house!! Thanks to everyone who joined us in reaching this point and enjoy being with us for the year ahead. Holi is the festival of colours. Most of the students had gone for holidays but those who stayed had a lot of fun. putting colour on whoever they could find. In the picture they have just got their mathematics teacher after a lot of chasing him around. You can see in the fourth photo that they got me too. India is a land of fairs and festivals. The Hindus, the Muslims and the Christians have their own festivals. The Holi is an important festival of Hindus. It is a festival of joy and happiness. It is celebrated every year in the month of March in the spring season. In India spring is the best of all seasons of the year. The festival of Holi is celebrated in the memory of devotee Prahlad, who had great faith in God. Hiranyakashyap, who was the king and also Prahlad’s father, tortured him but he did not give up his faith in God. Hiranyakashyap’s ego had become so big that he thought that only he himself should be worshipped. Hiranyakashyap asked his sister, Holika, who possessed a shawl that protected her from fire to sit in a burning fire with Prahlad in arms. As they sat in the flames wind swept away the shawl and Holika was burnt to ashes but Prahlad remained untouched by the flames. On the day of Holi a bonfire is burnt representing the burning of Holi and Prahlad, who is represented by a coconut is pulled out of the flames unscathed. Men, women and children sing folk songs. They sprinkle coloured water and coloured powder on each other. Even the old people enjoy this festival of colour. This festival removes social inequality. The rich and the poor, the high and the low, the weak and the strong enjoy this festival together. It creates the feelings of friendliness and mutual relationship among the people and celebrates the victory of humbleness and devotion over rampant ego. A view of our new Science Laboratories. A wonderful facillity.